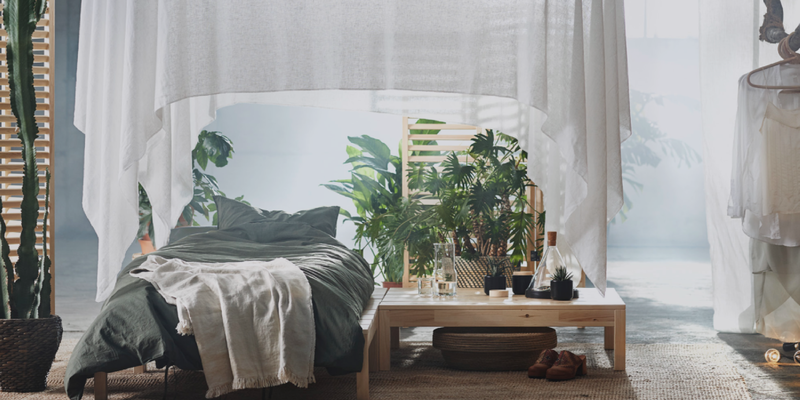 ÄLMHULT, Sweden — IKEA is the latest retailer to go after a slice of growing global wellness market, with a new range that encourages consumers to reconnect with nature and themselves. “The HJÄRTELIG range is IKEA’s first full range which focuses on helping people improve their emotional and physical wellbeing,” comments Alee Abas, Sales Leader for Bedrooms at IKEA UK and Ireland. Designed to cater to the increased desire for people to connect with the outdoors, the HJÄRTELIG collection aims to bring the outside in by using sustainable materials and earthy colours to create IKEA’s first ever yoga mat, as well as scented candles, bedding and plant pots. Each item in the collection encourages people to step away from the chaos of everyday life and is designed to create a pleasant atmosphere for rest, relaxation and gentle exercise. “We know that British people are some of the most hard-working in the world and that’s why we believe it’s important to take a step back from the often-hectic modern life to re-focus and re-vitalise,” says Abas. In an attempt to appeal to the senses and help people feel grounded, materials used in the collection include cork, linen, rattan and seagrass, which add to its natural look and feel whilst also being environmentally friendly. The textiles in the collection are made from cotton that is either recycled or grown in a more resource-efficient way. “Many people know that their mental and emotional wellbeing is as important as and can affect good physical health,” comments IKEA. The HJÄRTELIG collection hopes to combat these feelings by inviting people to press the “pause” button on a daily life that’s often hectic, complicated and online, argues the retailer. With consumer demand for wellness lifestyle real estate on the rise globally, bringing elements of wellness into the home through materials and objects is a trend more and more retailers are embracing. “We’re at the beginning of a new movement in home and community design that tackles our uniquely modern problems: sedentary lives, unhealthy diets, stress, social isolation and loneliness, pollution, nature-deprivation, etc,” argues GWI Sr. Researcher, Katherine Johnston. And with consumer spending on wellness now starting to focus on the places they live, for retailers like IKEA that can tackle the unhealthy home environment, the opportunities are vast.